Clubs at grassroots levels are invited to participate in the Football Against Racism in Europe fortnight of action this October 11-25th 2018. The FARE fortnight is an opportunity for clubs in Ireland and across all UEFA affiliates from grassroots to Champions League level to promote respect for diversity and to make a stand against racism. 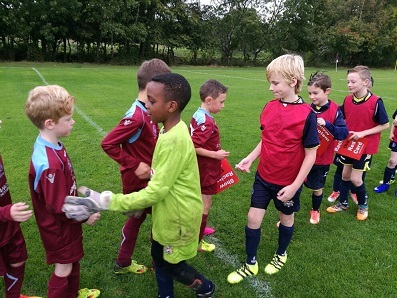 Contact the clubs you are playing during the campaign period in October, and explain to managers/mentors that your club is supporting the FARE campaign by exchanging wristbands at the start of your match (es). Agree with opposition that players will exchange wristbands just prior to the start of the match and shake hands (Champions League style). Agree with mentors and managers that they will need to explain to players prior to the match (during warm ups) why your club is supporting this campaign. Use anti-racism signage cards for a group photo with all players. Display the anti-racism signage cards after use in prominent places in your club (clubhouse, changing rooms etc.). To get involved, please complete the expression of interest form and send. Friday 21st September is the deadline. However an early submission of the Expression of Interest form is advised, as stock is limited.